By design, marinas are vast open spaces – ideal for boats, but challenging for WiFi signals. Similar to hotel WiFi, conference centers and large entertainment venues, the signal needs to cover an extremely large area, but with one additional challenge: marina WiFi equipment has to be able to withstand constant exposure to difficult weather conditions. Whether you’re planning to install WiFi in your marina for the first time, or you’re upgrading your current network, you’ll want to work with a service provider who specializes in marina WiFi installation and support. Here are 6 questions to ask when you’re looking for a marina WiFi service provider. Will you perform a site survey? Make sure the marina WiFi service provider you choose performs an in-person site survey, both before and after installation. The provider should explain how they plan to install the system and, after installation, offer training on how to manage and monitor it. Deep Blue performs site surveys on all projects, and our certified project managers ensure everything runs smoothly from start to finish. Upon completion, we also conduct post-install training for onsite staff. Do you offer WiFi installation? You don’t need to know how to install cabling and hardware, or configure access points and security settings, but your marina WiFi service provider should. Regardless of whether you are building a new network or restructuring outdated technology, it’s important to choose a company that has experience with marina WiFi installation. Deep Blue has engineered and installed more than 2,500 WiFi networks since 2004, and we pride ourselves on having one of the most experienced, professional and knowledgeable WiFi engineering and WiFi installation crews in the industry. Is your equipment designed for all weather conditions? Your marina WiFi service provider should take into account all potential environmental hazards and have a plan for protecting or replacing damaged equipment. For example, what happens if lightning strikes? Find out if replacement costs are included in the budget, or if should you expect additional expenses down the road. While there is no way to a lightning strike or salt corrosion, Deep Blue protects your investment by factoring in the costs of protective gear and replacement equipment when designing your marina WiFi network, and we use the best lightning protection available to prevent damage to other pieces of the network. Is 24/7 WiFi support available? Your marina doesn’t close on nights and weekends, and neither should your WiFi service provider. If there’s ever a problem with your WiFi network, knowing you have a service provider that will handle it promptly and professionally ensures peace of mind. Deep Blue uses the best real-time monitoring tools in the business to ensure your marina WiFi network is running smoothly around the clock, quickly diagnosing and solving any issue in a timely manner. We also provide live, U.S. based WiFi support 24 hours a day, 7 days a week, 365 days of the year, as well as on-site visits, maintenance and emergency response teams upon request. Will my network have dual-band technology? Dual-band technology means your WiFi network can simultaneously support devices that use the 2.4 GHz band frequency, such as smartphones and tablets, as well as those that use 5 GHz, including laptops and gaming consoles. Marina WiFi networks with dual-band technology, like those installed by Deep Blue, not only support backwards compatibility for older devices, but they double your potential wireless bandwidth and can help eliminate interference from metal, concrete buildings and large yachts. Will I be able to manage my bandwidth? Every time a user accesses your WiFi, they are decreasing your bandwidth and potentially slowing down your network. 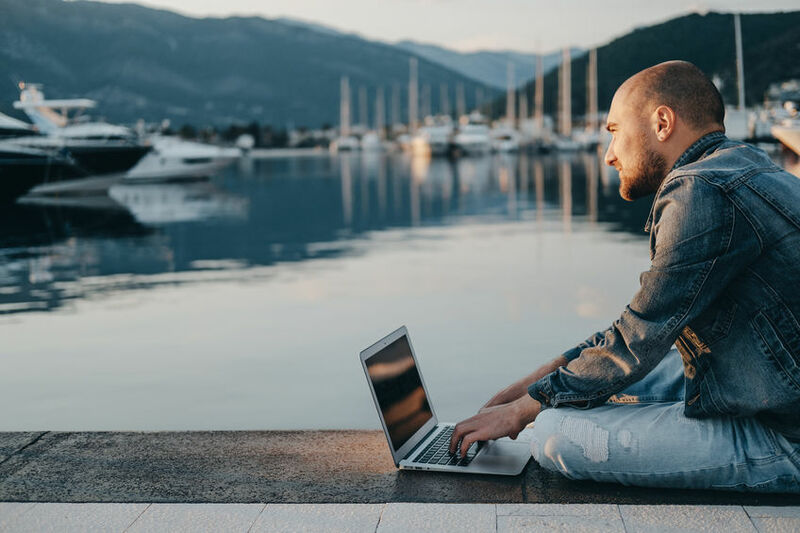 To manage bandwidth consumption and ensure everyone in your marina stays connected, you need to be able to monitor your bandwidth usage, as well as set your upload and download speeds, cap user bandwidth, and offer tiered free and paid WiFi options. Deep Blue’s technology allows you to do all of this and more. In fact, if you decide to offer a combination of free and paid WiFi access, we can even integrate with your PMS system to authorize charges directly to a customer bill, and establish free zones. Looking for a Reliable Marina WiFi Service Provider? Deep Blue Communications has been an industry leader for more than 15 years, engineering, installing and managing marina WiFi networks and providing 24-hour WiFi support. To learn more about us, check out Why Choose Deep Blue or call 1-844-554-3826 to find out how we can help you.